Orchid lovers who grow dendrobium orchids enjoy robust-growing orchids that thrive in growing environments with bright light and adequate ventilation. Dendrobium orchids put forth a wide variety of blossom colors, with bloom periods often extending over a two-month period. While cool-growing dendrobium orchids prefer a small and cramped growing container, intermediate and warm-growing dendrobium orchids desire fresh potting soil every year or every other year. Repot dendrobium orchids after the orchid finishes blooming to rejuvenate the planting media. Place the small chips of broken terracotta pot in the bottom of the planting container to help the potting soil drain more efficiently. Mix 10 parts fir bark with one part orchid potting mix. Use fine fir bark for containers smaller than 6 inches. Use medium fir bark for containers larger than 6 inches. Fill the planting container approximately one-third full of the planting media. Remove the orchid from its current container. 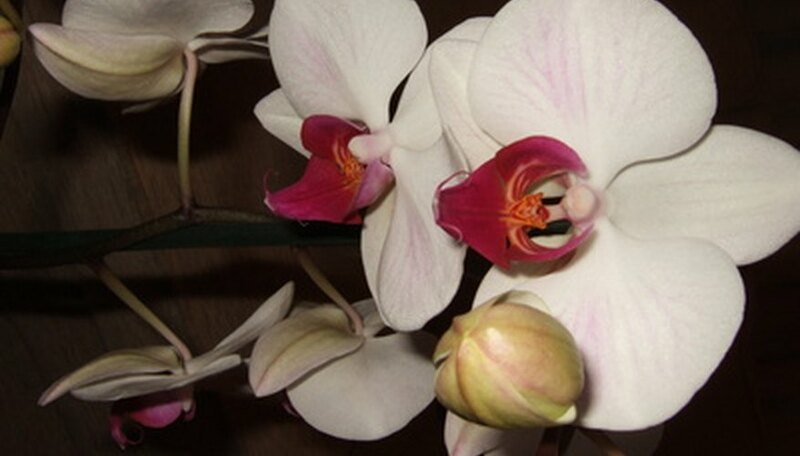 While you have the orchid out of its container, look at the root system. If you find any diseased or dead roots, remove these parts by cutting them off with a sharp knife. Place the orchid in the new container and fill the container with additional planting media to fill it to the top. Firm the soil lightly with your hands around the top of the container. Water the newly repotted orchid and place it back into its regular growing location.